anything can be done with time and money. You'll have to extend every wire from everything other than the tail lights and rear speakers. thats gonna be ALOT of spicing...a WHOLE LOT! getting that many different colors of wire will be expensive. Using only one or a few different colors will be confusing as FAK. best bet is to do one harness at a time marking each wire. bundle each harness as a group by using electrical tape or zipties. solder + crimp connectors + shrink wrap. having your low voltage electronic connections in an area such as the trunk could be risky. Make sure your tail light gaskets are new, your trunk seal is new, spoiler hardware is tight, and your moon roof drains are clear and in good shape. 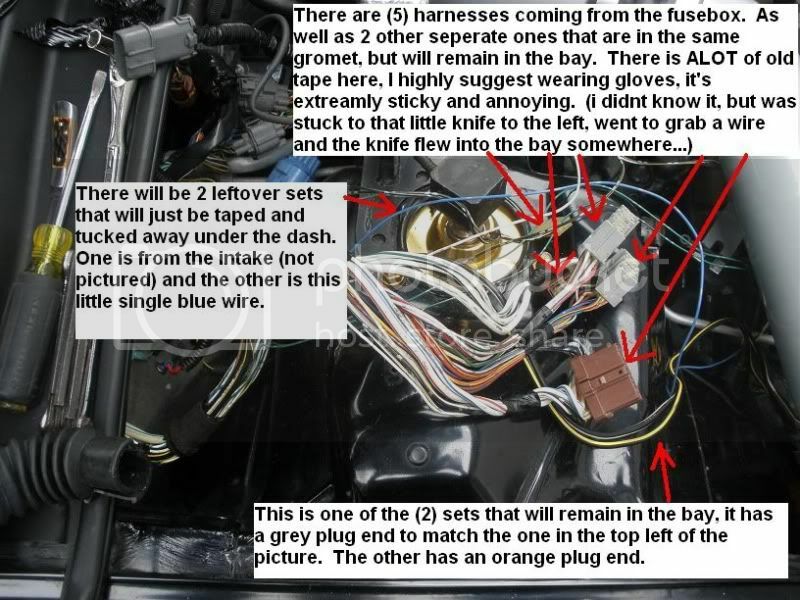 i plan on putting it where the jack is supposed to be since i dont have a jack anymore, the reason for checking all the above mentioned is so that water does not com in contact with the fuse box? at least a week for sure...there are tons, TONS of wires in the harnesses. and there are four harnesses i believe. best of luck to do something like that. jejeje, i guess as much, the cable am going to use any advise as to what type of guage? Match the gauge of the wire you're splicing to, or go with a slightly bigger gauge. Never go smaller. Wires! I really strongly advise you use more than one color like OGS said. If you only use one color wire, if you ever have to troubleshoot something you are going to hate yourself for not using different colored wire. Believe me, your asking for a nightmare if you don't. this is going to be a hell of a project! try to give us updates if you actually do go about this. so you mean the ones that stay in the engine bay? also why do you need the amp breaker? will i need it? the BEST way to build your own wire Harnesses is in groups. you can take this a step further by grouping your shrink wrapped pairs into groups of, say, 4 colors of shrink wrap. Last edited by LilMsPrelude; 06-29-2011 at 05:05 PM. you can take this a step further by grouping your shrink wrapped pairs of 8 into groups of, say, 4 colors of shrink wrap. I will draw it out for you.... think of it like an upside down tree.... one tree trunk branches out into smaller trunks which branch out into smaller branches. And for the Circuit breaker question.. ABSOLUTELY it is necessary. You are passing some relatively hi amperage wires through metal structures and other areas of possible damage/shorting of the wires. Unless you want your car to be featured on the nightly news; use protection. since because i did not heed the waring to use protection we i got my wife Pregnant i will listen to this advice, and thanks for the help, where would i put the amp breaker? , where would i put the amp breaker? within 18" of the battery or before the wire goes thought any metal structure; which ever is closer. Honestly, it's not a good idea. As everyone else has stated - you're talking about removing and cutting every single wire used to control your cars electronics. It's a doable with the right amount of time and patience, but you need to take into consideration how many walls you could come across in the time of an electrical issue. Any wire can short or be damaged, be it by a mouse in your car or nicked upon installation without noticing. Taking into consideration the size wire you would need for that distance, and the fact that you only have 2 options as far as paths to the trunk - the big question would be: will it all fit? You could run it along the passenger side, but the carpet will be stretched to it's limits with all that you will be running. For me, the bottom right side panel in the passenger foot-well is barely staying shut with a 0/1 gauge welding cable for my battery relocation and the current existing wires running back towards the trunk. As well as my carpet between the seat and door sill is stretched to where if i needed to put another 2 gauge wire - I would be maxed out for space. The other option is to run it down the center consul, which would require you to either run it under or around your back seat (if you have one) leaving it in prime kicking/stepping spot if you were to have passengers or be back there yourself. Again, maxing beyond the stretching limit of your carpet and being noticeable. Also take think about how much more heat will be present through the fusebox with the power flowing that kind of distance - even with a thicker gauge wire, I would imagine that's going to put a bit more of a strain on a tiny stock fuse. As LilMsPrelude said - a breaker is a MUST for this. Anything involving moving the battery will definitely require a breaker - and in your case you will still have one 0-2 gauge wire going to the front of the car for the alternator and starter. Why?? Would you go through all that work? Is the fuse box really that much in your way down there by your foot? i went through alot of work just to get it in my glovebox...i cant imagine trying to get in the the trunk...like wing said, there are a lot of risks involved, but props to you if you go through with it...take tons of pics! If I were you I would just stuff the damn thing up where the pass. airbag used to be and call it a day. I'm still working on de-pinning and re-pinning all of the plugs that feed through the firewall. It takes FOREVER and there are hundreds of ways that it can be messed up. It's a great idea! Even I started to wonder about relocating my fuse box and ecu to the trunk! It's not worth it! I promise. Not to take this off-topic, but why did you need to de-pin the harnesses? or do you mean the new ones for the J-swap?